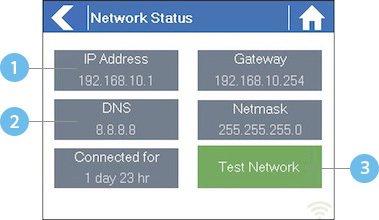 From the Home screen navigate to the Network Status by pressing Status⇒Controller Status. All settings on this page are provided to the controller by your wireless router when it first connects via a protocol, known as DHCP. If any of these settings appear incorrect please change them in your wireless router. Checking WiFi Performs a ping test to the Gateway address listed in the Network Status screen. If this test fails, check that you don’t have MAC address filtering enabled on your router. Checking DNS Performs a ping test to the DNS address listed in the Network Status screen. If this test fails, check that the DNS address is correct – if it is wrong then correct the DNS address under DHCP Settings on your wireless router. It is possible that this test may fail if the DNS server doesn’t accept ping requests which do not indicate an issue. Checking Internet Performs a ping test to the Google server at IP address 8.8.8.8. This is a well-known server which accepts ping requests on the internet. If this test fails then it indicates an issue with the internet configuration of your wireless router. Checking Hydrawise Performs a ping test to the Hydrawise servers. If this test fails then it may indicate an issue with the internet configuration of your wireless router.